Inzwischen hat fast jeder Kontinent sein eigenes Social Trading Network. In Europa etoro, in den Staaten FX Junction und in Down under gibt es seit November 2012 FX COPY. Die Technologie stammt von FX Junction, was man auch unschwer am Design der Website und der Plattform erkennen kann. Kopiere die Trades Deiner Favoriten oder werde selbst ein Toptrader. 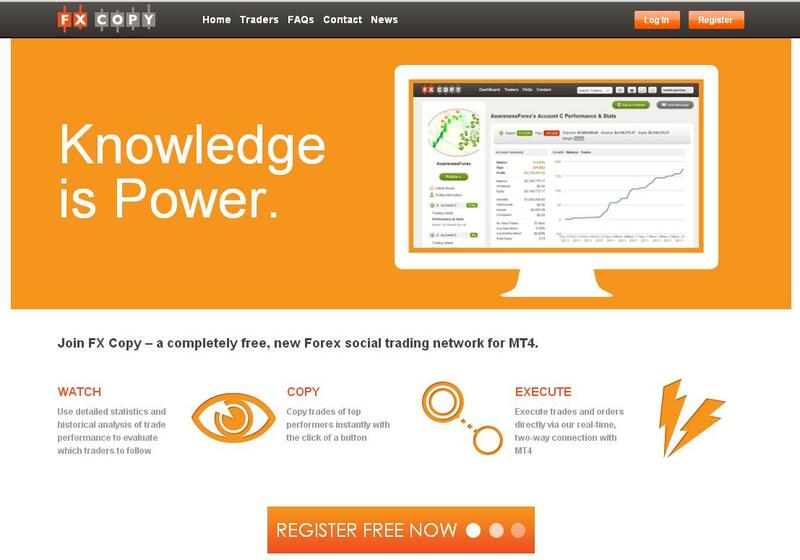 FX Copy, the free Forex Social trading network, released in mid-September, 2012, has reached over 2,550 Social Trading members with numbers climbing steadily. The innovative FX Copy platform is a dynamic social trading community where traders can meet, interact, and share with other traders. 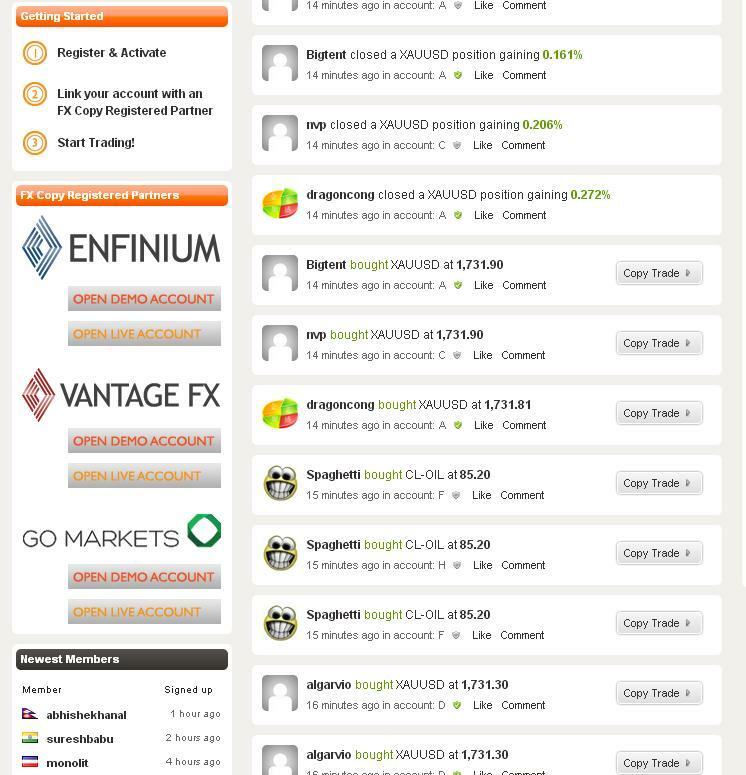 Of the 2,550 members, over 660 have linked up their trading profiles to their MT4 accounts provided by FX Copy registered partners Enfinium, Vantage FX and GO Markets. FX Copy is a great tool for both trading beginners and also, the more advanced trader. FX Copy provides valuable insight into top performing trader’s activities in the Forex market. Traders have the power to watch and engage directly with other top traders. With access to real-time and historical trade activity, trading members can successfully track, monitor and even, directly copy trades of profitable traders on a user-friendly platform. 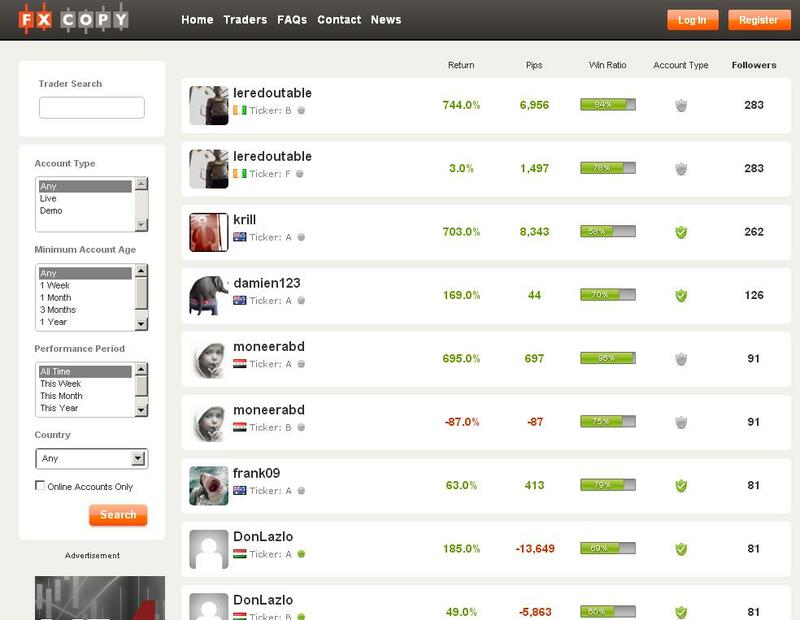 Already, notable members have started to appear, including trader ‘Krill’ who, at the time of writing, is sitting on an all-time return of 704% profit with 225 members following his profile. 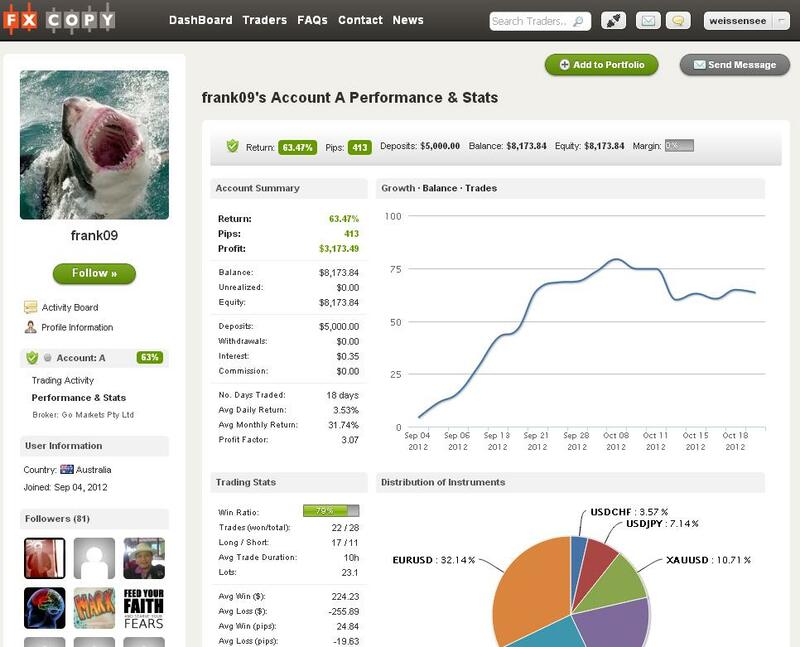 Members have the option to learn and follow traders like ‘Krill’ and many other top performers. Members can completely customise their user experience to find traders who match their desired trading style using a series of filters and analytical tools available for use across the array of individual trading profiles. FX Copy is a completely free, new Forex Social trading network, where traders can follow and copy trades of top performing Forex traders. FX Copy is a development and trading brand of Enfinium Pty Ltd which is authorised and regulated by the AFSL 322081. Enfinium clients benefit from direct market access to stocks, options, futures, forex, bonds and funds on over 80 market destinations worldwide, best price execution, ultra-low trading commission, live streaming quotes, low option margin, high interest earned and low financing costs. Es gibt jedoch eine erfreulich hohe Anzahl an Real Money Tradern. Die Informationen zu den Händlern sind gut aufbereitet und übersichtlich dargestellt. Wie man auch dem folgenden Screenshot entnehmen kann, ist die Community noch im Wachsen begriffen, denn die Spitzentrader vereinen gerade mal 100 bis 300 Follower auf sich. Ich gehe davon aus, dass dieser australische Anbieter in 2 Jahren nicht nur regional Freunde findet, sondern weltweit agieren wird. Hierzu gehört dann aber auch eine extrem erweiterte Brokeranbindung in der Art, wie FX Junction sie praktiziert. Für etoro nur eigene Plattform und bei FX Copy auch vorerst nur 3 Broker aus Australien bzw. deren britische Muttergesellschaft. Für ACT-Trader bei AvaTrade ist tradeo auch geeignet. Wer über den Tellerrand etoro, zulutrade und ayondo hinausschaut, kann sicher einige interessante Forexhändler finden, denen er mit diversen Strategien folgen möchte.